Spend your holiday in the beautiful medieval village of San Gimignano, well known all over the world as one of Tuscany's treasures. It is the only example of a medieval city which has preserved through the centuries many of its ancient and beautiful towers. Set on the top of a hill, San Gimignano dominates the surrounding Tuscan countryside. The city of San Gimignano took its name from the saint, then bishop of Modena, who helped the tuscan village to fight against the barbarians. The origins of the town date back to the Roman period, when the consul Silvio was forced to leave Roma with his followers. Because of this, the town of San Gimignano was anciently known as Silvia. Between XIII and XIV century, San Gimignano was known as a very important town, for its commercial activity as well as for its poetry, architecture and the arts in general. The beautiful medieval village of San Gimignano is well known all over the world as one of Tuscany's treasures. It is the only example of a medieval city which has preserved through the centuries many of its ancient and beautiful towers. San Gimignano can always amaze the visitor with its charm, beauty and the unique atmosphere of its historical center, which is almost intact. The ancient walls embrace the built-up area, with its square, streets and alleys that offer magical glimpses andunforgettable corners. Set on the top of a hill, San Gimignano dominates the surrounding Tuscan countryside. San Gimignano is 40 km from Florence, 65 km from Pisa, 30 km from Siena, 28 km from the etruscan Volterra, only a few minutes from Chianti and one hour from the sea. Thanks to its central position in Tuscany, San Gimignano offers its guest the opportunity to spend a relaxing holiday in the town, or to go for a trip in the surrounding area. 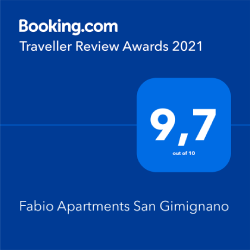 It is not only a peaceful and ancient place to stay, but also a perfect starting point to visit all major places in Tuscany: this makes San Gimignano one of the best places to spend a holiday. In the famous Piazza del Duomo, in front of the Cathedral, near the Palazzo del Podestà and the little city theatre (XVI century), is set Palazzo Chigi, one of the most ancient and prestigious buildings in San Gimignano. Its history is strictly linked to that of the city. It is a patrician building, with a large front split into different levels. This is a typical example of a local house with tower, which in the Middle Ages was an important symbol of nobility and power. The Ancient Documentation of the building tells us that it was constructed in the first half of the thirteenth century. Although the building takes the name "Chigi", the Chigi family was not responsible for its construction, but perhaps Count Antonio was the most important person that lived in it. The building belonged to the families Savorelli and Abbracciabeni, and later became the residence of the Useppi family. This powerful family had many successors, some of them were engaged in local policy (they were Guelfi), and others were dedicated to the lucrative saffron trade, which was the main activity in San Gimignano. Appreciated for its artistic beauty, the building is one of the richest and most important testimonies to the art and history of the town.